The Fitzwilliam Museum holds over four hundred medals acquired by an investment banker named Lester Watson (1889-1959). These fascinating objects can now be displayed thanks to the generosity of the Watson family and Cambridge in America. Many relate to British imperial expansion across the globe during the nineteenth century. They cover conflicts in the Gold Coast, Egypt, Southern Africa, Afghanistan, India, Burma, Java, Borneo and China. Perhaps the most striking aspect of these objects is their use of iconography. Some bear stylised depictions of colonial warfare and panoramic views of conquered landscapes. Others display allegorical scenes featuring classical figures and heraldic animals. 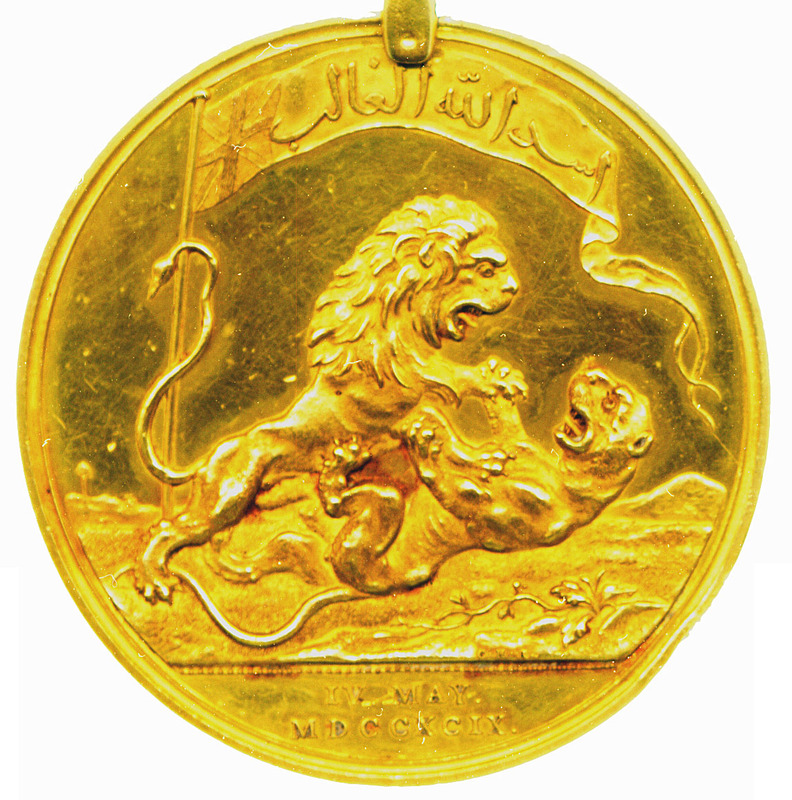 The image above, for example, is the famous Seringapatam Medal. It commemorates the defeat of Tipu Sultan, one of the East India Company’s foremost military adversaries, in 1799. A British lion can be seen subduing an Indian tiger below a standard bearing the words ‘The Lion of God is Conqueror’. The Lester Watson Collection provides a unique opportunity to examine the British Empire, its conflicts and its self-image. The Fitzwilliam will host several talks on this theme over the coming months. A selection of some of the most thought-provoking medals will also be on a display in the Glaisher Gallery later this year.